A Singapore Trilogy was written by National Arts Council Young Artist Award winner Dr. Chen Zhangyi. The three chamber operas pay homage to our national obsessions - kopi, food and shopping. Kopi for One, Laksa Cantata, and Window Shopping follows a woman as she reflects on her life as a daughter, wife, career woman, and the relationships she has between her father, fiancé and herself. The show featured veteran singers Ee-Ping, Akiko Otao, Jonathan Charles Tay and Felicia Teo, as well as the new generation of Singaporean singers, Ng Jingyun, Phoebe Chee, and Ng Samuel. Collaborating artist Alvin Mark Tan joined the team for a multi-sensory journey. "Thank you L'arietta for an exhilarating emotional ride on the opening night of Singapore Trilogy. Stellar performance by a stellar cast - electrifying vocal display combined with deeply moving acting, gorgeous sets and effective lighting transported us through time while exploring the various stages of life. This production showcased local talents and makes us proud to be Singaporean! Bravo!" "L'arietta Productions' A Singapore Trilogy is an amazing production, and I am very excited to see local operas being commissioned. Singaporean composer Dr Chen Zhangyi has developed a unique musical language quite unlike anything else, one that simply draws you into another realm, letting you look at these seemingly "everyday slices of life" with a new pair of eyes...The future of opera in Singapore, as well as Singapore opera, is bright with L'arietta Productions, and I look forward to even more productions that touch us." L’arietta Production presented an 75 minute operatic adaptation of Alice in Wonderland, set in a magical garden, filled with nostalgic toys and modern twists. Kids and kids at heart enjoyed a mini-carnival as well as the opera! The show featured opera veterans Akiko Otao, Leslie Tay, Brent Allcock, as well as fresh faces to the Singapore opera scene. The production welcomed collaborations with award-winning video artist Pandora Wong, as well as local hat brand The Girl with a Hat, and the return of Namiko Takahashi Chan as she reveals an entire line of hand-painted costumes. L'arietta Productions opens the 2017-2018 Great Literary Works Season with Gordon Crosse's adaptation of W.B. Yeats. Written in 1966 by British composer Gordon Crosse, the opera utilizes Yeats' original text in its entirety. Directed by theatre veteran Eleanor Tan, this production will depart from its original Irish setting to an old Peranakan household filled with matriarchs of the past. On the anniversary of the mother's wedding night, remorseful spirits of the Old Man's parents appear in the house where unspeakable horror unfolded when he was 16 years old. He brings his son to the ruined house and reveals the darkness that haunts this family; the drunken father, the mother who died giving birth, and the Old Man who stabbed his own father... Now the Boy is the same age as he was when the curse was set. What grim choices face this family? Will there be redemption for the dead and the living? Purgatory was Singapore’s first immersive experiential opera, where live painting, devised theatre, poetry, visual art, and opera will merge for an hour of macabre spectacle. Part absurdist, part minimalist, all comedy. L'arietta presented the South East Asia premiere of Tom Johnson's cult classic opera which only consists of 4 notes. Mary Ann Tear returned as director, this time with a troupe of non­-singing physical theatre actors. The humour of the text was highlighted in a very visual way and the intention throughout is to appeal to the audience’s aural, visual and kinaesthetic senses as they identify with the different characteristics of the various types of singers. 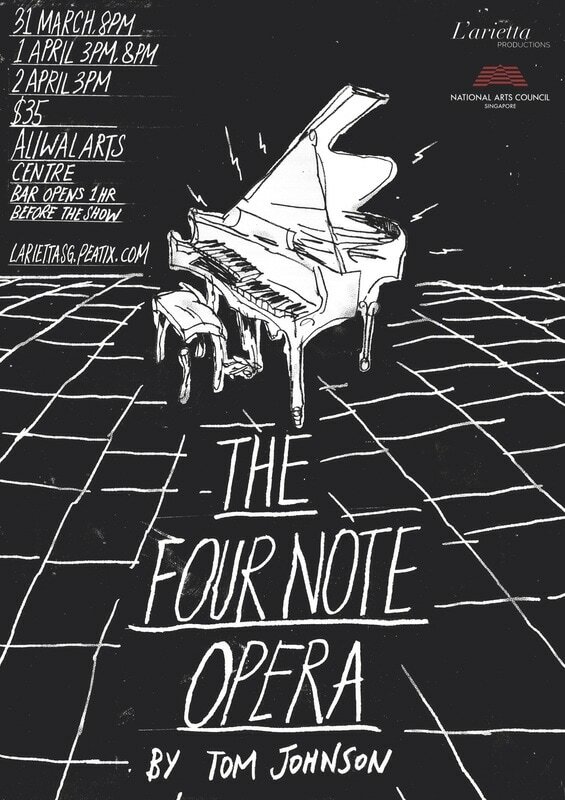 The Four Note Opera was performed by Singapore ­based singers soprano Akiko Otao, mezzo soprano Angela Hodgins, tenor Leslie Tay, baritone Brent Allcock with Aloysius Foong as the music director/pianist, and Thomas Manhart made a cameo appearance as the Bass. They were joined by exciting local physical theatre actors Gabriele Goh, Deborah Hoon, Haky Darsuki and Melissa Gan. Up and coming Singaporean visual artist Wan Xiang Lee joined the team for a true multi­disciplinary experience. Set in a bar where Figaro frequents. 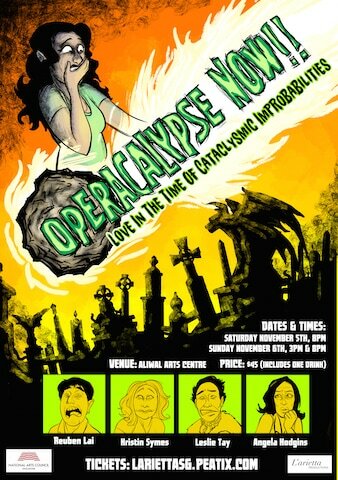 3 dark comedy operas are presented in one, about people looking for or finding love at the most inappropriate times/places – the last hour before the end of the world; in a deep dark tomb; during a zombie apocalypse. Tickets included a drink, and with a Halloween costume contest, everyone was in the mood to celebrate the end of the world. What if we took the quintessential elements of opera and presented it in 5 minutes, in the style of Puccini, Verdi, and Wagner? With the help of genre-defying violinist Kailin Yong and collaborative pianist Pauline Lee, L'arietta brought laughter to enthusiastic audiences in variety of occasions. ​L'arietta staged its first production to a sold-out audience in April 2016. Honestly! conveyed through three short operas that we never really say what we mean. The show also featured locally composed "Window Shopping", written by the National Arts Council Young Artist Award recipient Chen Zhangyi.